Girl: I look terrible in this dress. Dumb boy: Yup. You look like a clown, lol. Smart boy: No, not at all! You look beautiful as always! Boy who won’t get the girl’s number: LOL! 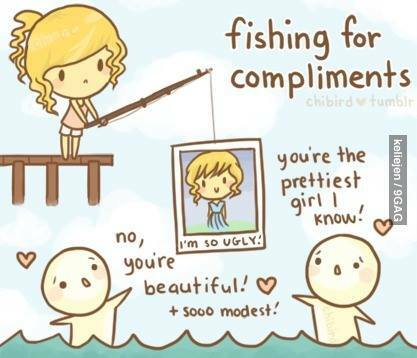 Stop fishing for compliments (停止釣讚美)! [詞彙Q&A] What is the difference between lack, lack of, lacking, lacking in?